Max was pulled from the Westside shelter with help from Akita Rescue who alerted us to his presence. We've been boarding him while he had some wounds looked at and to be neutered but now it's time to put him into foster care. He's still on medical hold for adoption pending bloodwork to make sure all is good with him. 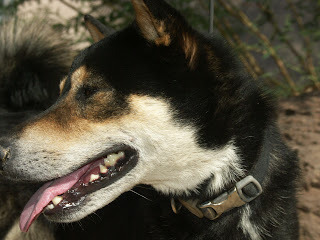 He is sweet and calm and was somewhat dumbfounded by the Akita he was sat next to. We need a foster home for him as Wendy is full. Rescue can provide all the supplies needed, xpen, crate, collar, lead, toys, food, treats but we need someone to take him in. He deserves more then being in a Vet's kennel. This is one of the things this Club is proud to say they do , rescue their favorite breed. Please contact Wendy at asahishibas@prodigy.net if you can help. Former Foster Yuki at home with his sister. Yuki has a new home!! !